If we were to travel back in time to Thanksgiving, November 25, 1971 and tell Abra Shapiro that in 2015, her stuffing recipe would be “blogged” about on the “internet” by two gay, legally married husbands using “digital” photographs that would instantly reach the entire world with a click of a button, she would think we were from another planet. Well, not only is this happening today, but her dish has been made consistently every Thanksgiving holiday since that rainy night forty-four years ago in Portland, Oregon where Ryan’s 21-year-old Aunt Kathy sat at the table and wisely jotted down the delicious recipe in between shared laughter, sweet potatoes, and red wine. 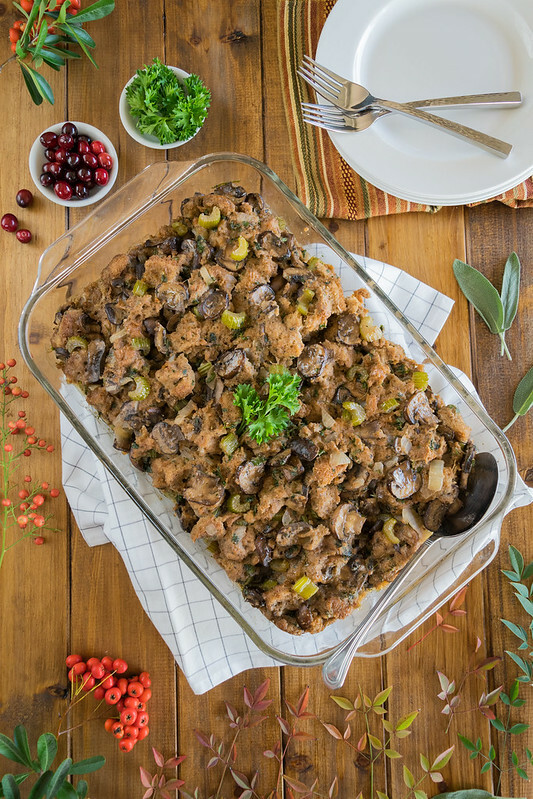 This baked mushroom stuffing has been a family tradition and a warm and fuzzy memory since that day, and it is a pleasure to share as our third selection on the Husbands That Cook Thanksgiving menu! 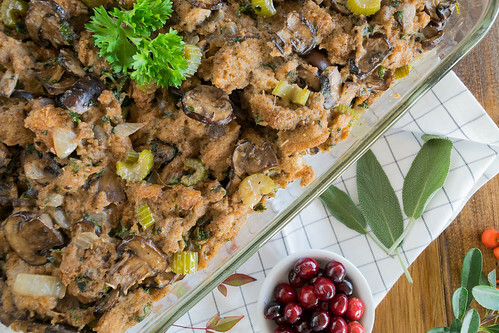 It is clear why this celebratory dish has been passed down for generations: It tastes like Thanksgiving. 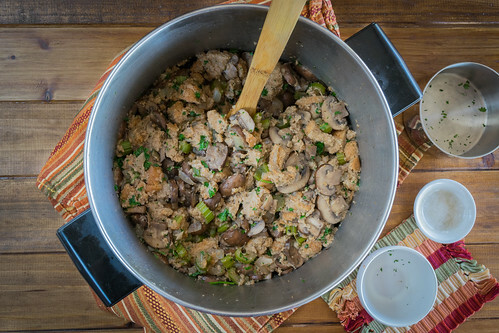 The recipe uses two pounds of sautéed mushrooms which are deeply spiced with fragrant sage, tossed with soft pieces of whole wheat bread, and complemented by tender-crisp slices of celery. 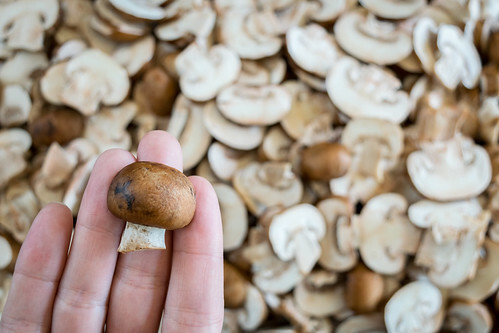 Common brown or white mushrooms (also called cremini), are full of flavor and work perfectly here. These rich ingredients are brightened with handfuls of fresh parsley, a chopped onion, a little salt and pepper, and poultry seasoning. If you are vegetarian, don’t be alarmed, as this spice does not contain poultry and it does not taste like chicken or turkey. It is a lively blend of aromatic herbs that combine sage, rosemary, and thyme and is widely available in grocery stores or online. 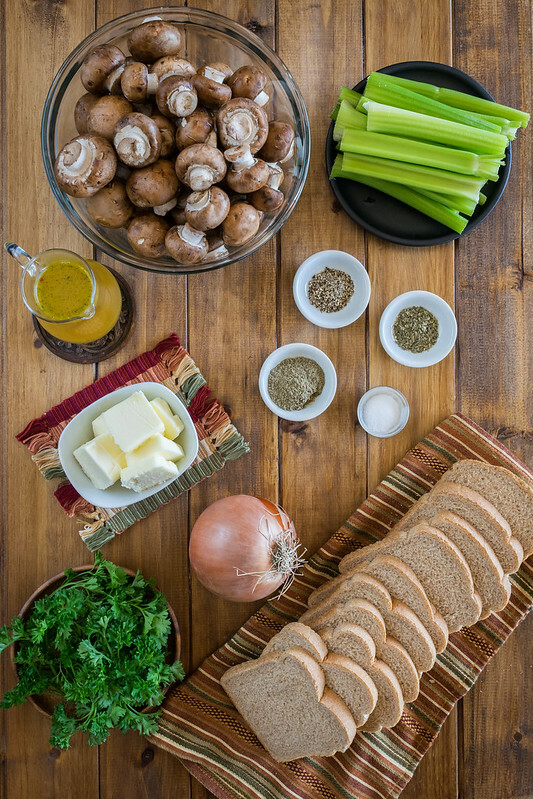 To get the best texture for your stuffing, we recommend using the most basic, soft wheat bread you can find. A fancy multigrain loaf with seeds is not right for this dish, as it will interfere with the smooth consistency. Why is this classic dish only made once a year when it is so delicious and easy to prepare? Everything is mixed into one large pot, you cook it on the stove, pour it in a pan, then bake it in the oven. When you look at all the ingredients, you may wonder how in the world they are all going to fit in one baking dish. 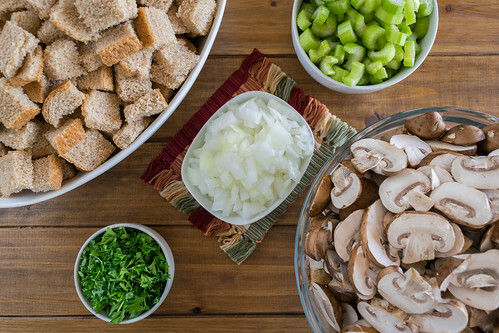 Two pounds of sliced mushrooms, an entire loaf of bread, plus celery and onions take up quite a bit of space, but you will be amazed how much they shrink once they start cooking. 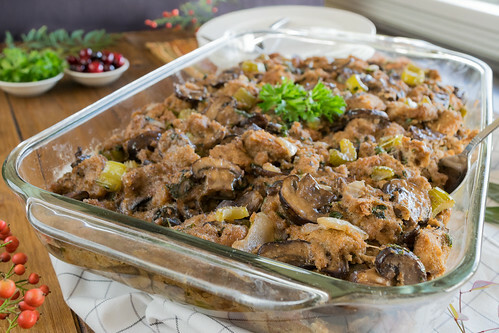 While it would have been impossible in 1971 for Abra to predict that the dish she brought that night would be viewed on mobile phones and computers around the world 44 years later, it is safe to say that this comfortable and satisfying vegetarian stuffing will be enjoyed and shared for another 44 years to come. Preheat oven to 350°F. In a very large pot (we use an 8-quart size), melt the butter over medium heat. 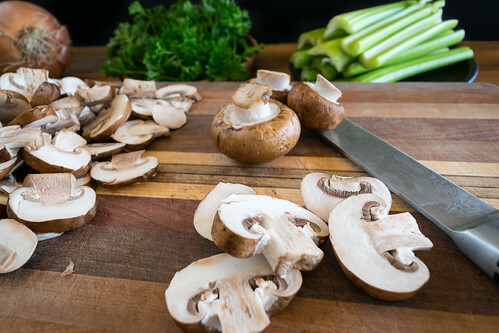 When melted, add the chopped celery, onion, and sliced mushrooms. Toss to coat, then sauté, stirring occasionally, until the vegetables have softened, 15 to 20 minutes. Then remove pan from heat, and stir in the vegetable broth, parsley, sage, salt, pepper, and poultry seasoning. When evenly mixed, add the bread pieces, and stir gently to combine. Transfer the mixture to a 9×13-inch baking dish, and spread evenly. Cover tightly with foil, and bake for 35 minutes. Serve hot, and enjoy! — For the bread, use a basic, soft wheat sandwich bread. 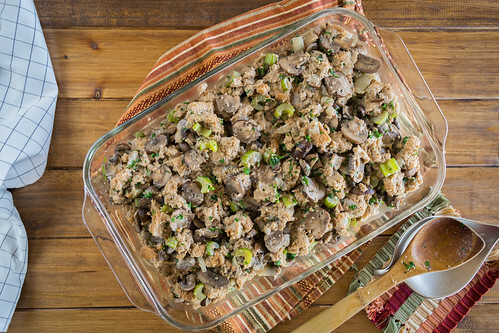 A multigrain loaf with seeds is not right for this dish, and would interfere with the soft texture of the stuffing. — Poultry seasoning is an herb blend usually containing sage, rosemary, thyme, and other spices. It widely available in stores and online. — To make this dish vegan, simply use a non-dairy butter.